Jason and I found ourselves in Seattle this weekend, so while Teka explored the geekiness of Rose City ComicCon, we sought out some geekiness of our own in the Emerald City. 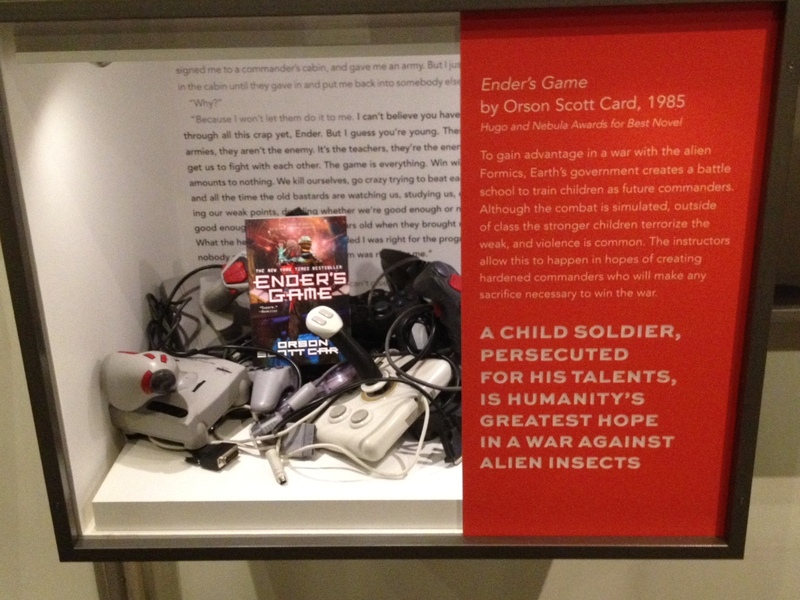 The EMP Museum, located in Seattle Center is home to the “Icons of Science Fiction” exhibit, and although it isn’t a huge exhibit, it contains plenty of geeky treasures. 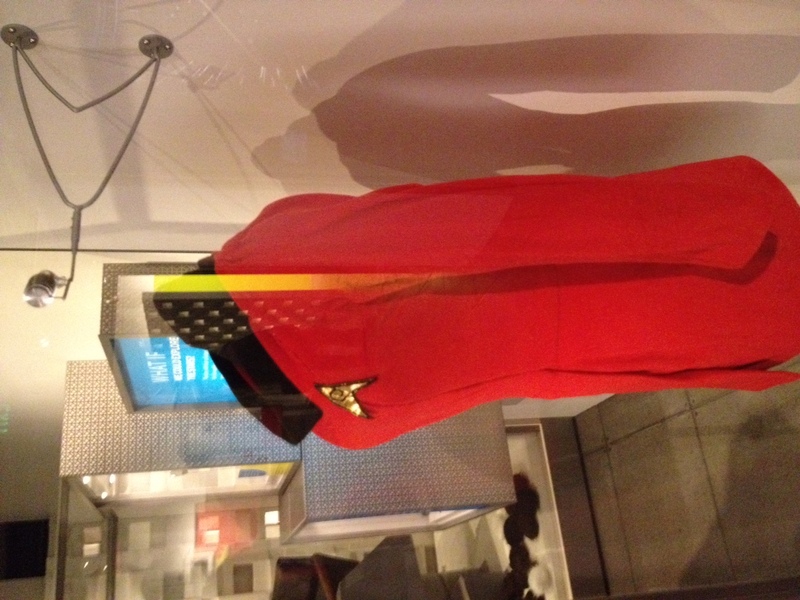 Yes, Nichelle Nichols actually wore this dress while playing Uhura in Star Trek: The original series. Right next to a Uhura’s dress, worn by Nichelle Nichols, was another artifact from my favorite television show; the Command Chair from the bridge of the original Enterprise. Although many artifacts from television and movies were displayed, the contribution of literature was not neglected in any way. 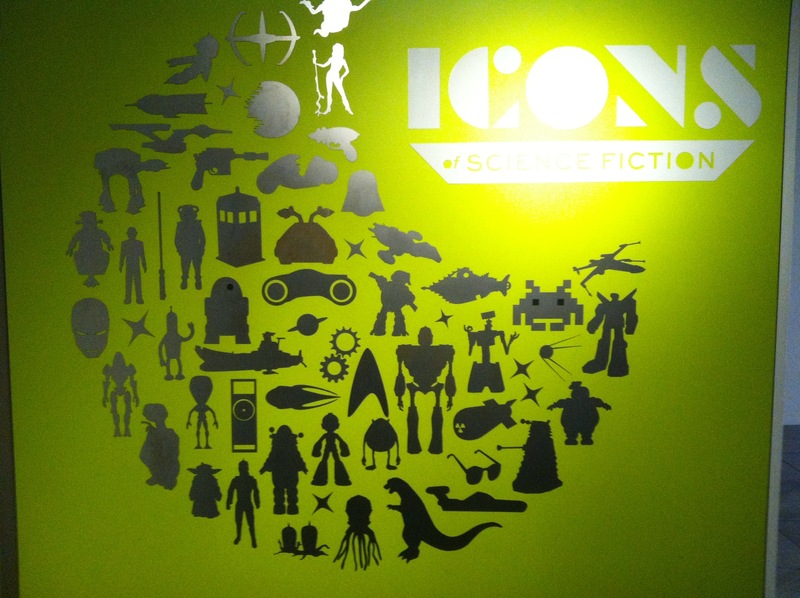 “Each of the featured questions in Icons of Science Fiction highlights two works of literature that explore the question, and are among the most important and enjoyable works in the field.” -From “Icons of Science Fiction” exhibit description. The questions, artifacts, and books were arranged in a well-curated way. For example, for the question “What if we could explore the stars?” right next to Colonel Jack O’Neill’s ID badge and goggles from the series Stargate SG:1, was displayed the book “Tunnel in the Sky” by Robert Heinlein. They even had a section where people could take a break to check the books out for themselves. 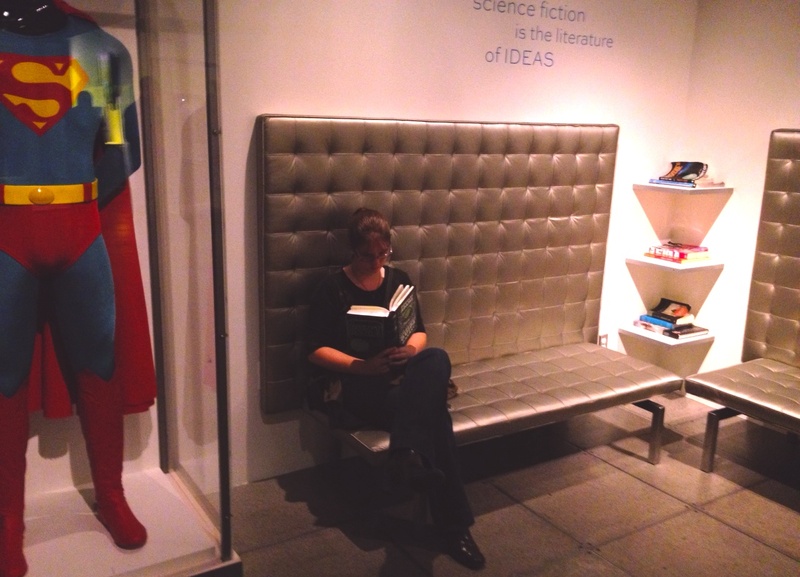 With his iphone, Jason caught me reading “The Hitchhiker’s Guide to the Galaxy” in the sci-fi reading area. The sci-fi exhibit was impressive, and eventually I found what I came for. The Fantasy exhibit was extremely impressive, and I’m not even necessarily talking about the displays. It was too dark to take many pictures, but the very architecture is part of the exhibit, from a mythical forest, to a cave with a (very large) sleeping dragon, and a mighty castle. The displays weren’t shoddy either. All in all, it was an exciting trip. If you are thinking about going, I would definitely recommend it! I admit, I spent a long time staring at this and testing my geek cred. 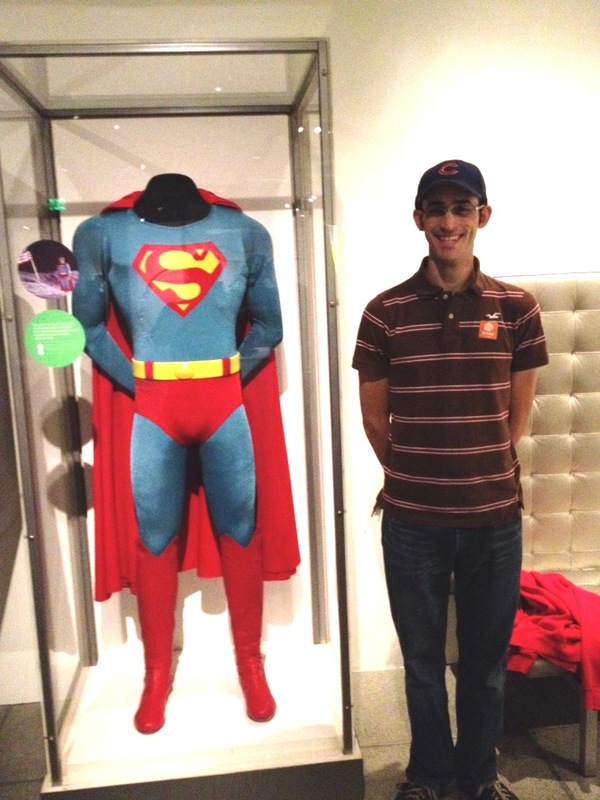 Crew member Jason is standing next to the suit worn by Christopher Reeve in Superman IV. Suit is cool, even if the movie wasn’t. 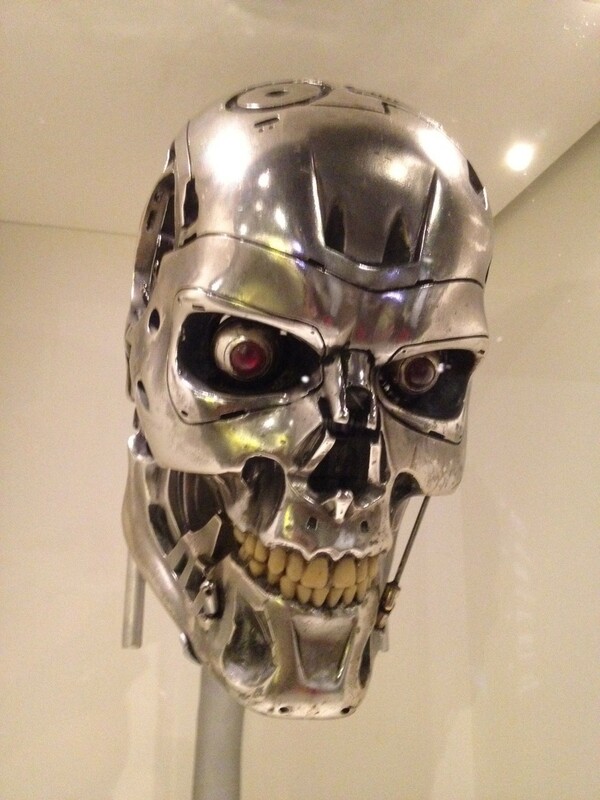 The Terminator Skull from Terminator 2 is still very very scary in person. 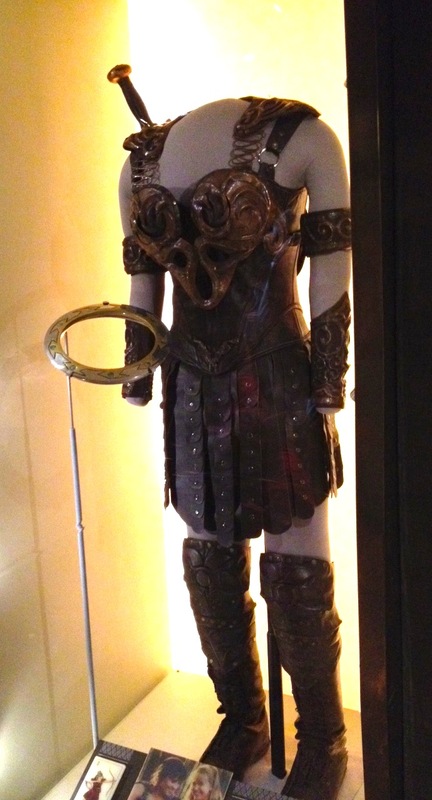 The outfit of Xena, Warrior Princess in all it’s glory. 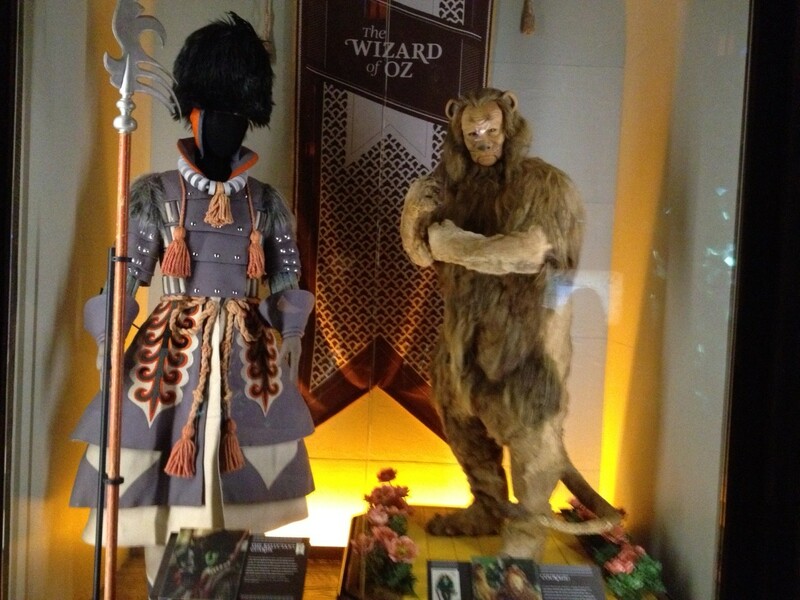 Apparently, the cowardly lion costume(featured here) is made out of real lion pelts and was therefor extremely heavy and difficult to act in. 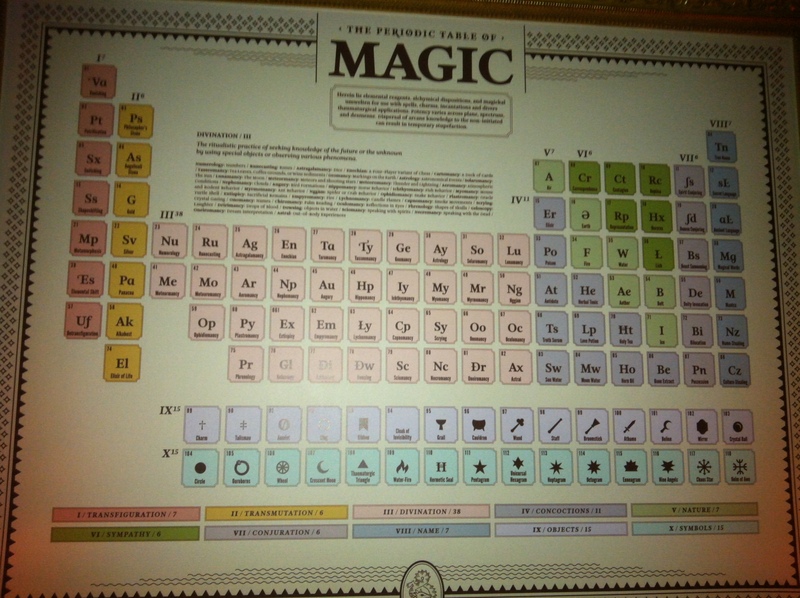 Always consult your periodic table of magic.